This watercolour not only portrays a child, at first sight it looks like it might have been made by a child. That big round blob of a head, with its rudimentary and rather shakily drawn features is certainly redolent of the way young children draw people. But the refined composition and palette are clearly beyond the capabilities of any child. The composition cleverly fuses the abstract with the figurative, the interplay of nervous lines and subtle colour shapes lending the portrayal an enigmatic psychological intensity. And yet it still looks like a child has painted a child. The Swiss painter, theorist and art educator Paul Klee (1879-1940) is acknowledged as a pioneer for the way he systematically examined the pictorial methods of the very young and used them to develop a modern painterly language. Klee was a primitivist in the sense that he modelled his paintings on children's drawings much as other artists, such as Picasso, were modelling theirs on 'primitive' tribal masks and figures in anthropological collections. Klee did his fieldwork largely at home, for example by studying the childhood drawings of his own son Felix in order to learn from this 'primitive' artist. In the early 20th century the concept 'primitive' embraced a wide array of arts, from exotic tribal carvings to European medieval paintings, folk ornament and child art. What linked these otherwise unrelated expressions was that they did not use the methods and skills developed by the European Renaissance tradition. For that reason 'primitive' arts aroused a conflict of values. While guardians of Renaissance tradition denigrated 'primitive' arts as uncivilised and inferior, artists of the avant-garde prized them, not only for their non-naturalistic forms but also because they seemed to offer the prospect of a return to an original state unsullied by centuries of European culture. Klee himself wrote in 1906 that he felt a great need to begin again 'beim Kleinsten' (at the earliest level): 'How I want to he born anew, to know nothing of Europe, really nothing. To know no poets, be completely without sophistication, virtually at the origin.’ For Klee children's drawings were not cute; they offered clues to deeper values. An exhibition currently at the Cobra Museum in Amstelveen, The Netherlands, shows how Klee's art influenced a new generation of artists who formed the Cobra movement in 1948. The young Dutch artists Karel Appel, Constant and Corneille followed Klee in modelling their art on child art. Constant even ascribed a revolutionary potential to children's drawings: they demonstrated a creativity that is innate to all mankind, which if unleashed could change society. Cobra's 'childlike' art was condemned by the Dutch press in 1949, though earlier that year an exhibition of child art at the Stedelijk Museum of Modern Art in Amsterdam had signalled that values were already changing in society. The postwar years saw a rapid and complete re-evaluation of children's art by artists, educators and finally the public. The scribbles of the untrained child became both vehicles and models of spontaneity and free expression. They have given rise to one of the most pervasive folk arts in the Western world: 'refrigerator art' (those little drawings stuck by proud parents on the doors of their fridges). Paul Klee did not live to see this widespread re-evaluation of child art. He helped to usher it in, though his own distinctly spiritual values were not often taken up by artists who followed him. Klee was not a Christian, but I hear certain biblical resonances in his words quoted above. It was Jesus who told the puzzled Pharisee Nicodemus that he needed to be 'born anew' to see the kingdom of God (John 3:3). And it was Jesus who instructed his disciples: ‘Let the children come to me, do not hinder them, for to such belongs the kingdom of God. Truly, I say to you, whoever does not receive the kingdom of God like a child shall not enter it’ (Mark 10:14-15). Jesus turned the usually subordinate child (see Proverbs 22:6) into a role model for faith, subverting the adult expectations of his disciples. Klee set out on his own spiritual quest to learn from 'the littlest ones', those who according to conventional wisdom are the ones who need to be taught. Paul Klee: Bust of a Child, 1933, watercolour on cotton, 50.8 x 50.8 cm, Zentrum Paul Klee, Bern Switzerland. Paul Klee (1879-1940) was born in Münchenbuchsee in Switzerland, the second child of Hans Klee, a German music teacher, and a Swiss mother. In 1880 the family moved to Bern. His training as a painter began in 1898 when he studied drawing and painting in Munich for three years. By 1911 he became involved with the German Expressionist group Der Blaue Reiter (The Blue Riders), founded by Wassily Kandinsky and Franz Marc in 1911. Klee and Kandinsky became lifelong friends. His work was also influenced by the Cubism of Pablo Picasso and Georges Braque and the abstract translucent colour planes of Robert Delaunay. In 1914, Klee visited Tunisia. The experience was the turning point in his life and career. The limpid light of North Africa awakened his sense of colour. During his stay, Klee gradually detached colour from physical description and used it independently, which gave him the final needed push toward abstraction. In 1920 Walter Gropius invited Klee to join the faculty of the Bauhaus in Weimar. A school of architecture and industrial design, it also included the study of arts and crafts. Nearly half of Klee's 10,000 works were produced during the ten years he taught at the Bauhaus. When the National Socialists declared his art degenerate in 1933, Klee returned to his native Bern. Personal hardship and the increasing gravity of the political situation in Europe are reflected in the sombre tone of his late work. Graham Birtwistle, who taught Modern Art History at the Free University in Amsterdam from 1971 to his retirement in 2004, has written extensively on Cobra, a post WW II avant-garde art movement. His book Living Art (Reflex; Utrecht, 1986) dealt with the theories of the Danish Cobra-artist, Asger Jorn, in the later 1940s. - Exhibition and Catalogue: Klee and Cobra. 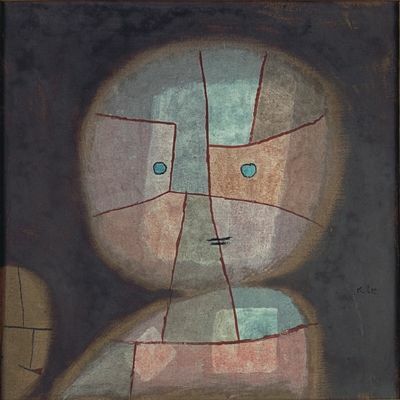 A Child's Play, Bern, Switzerland (Zentrum Paul Klee, 2011); Amstelveen, The Netherlands (Cobra Museum, 28 January – 22 April, 2012). - George Boas, The Cult of Childhood, The Warburg Institute, London 1966. - Jonathan Fineberg: The Innocent Eye. Children's Art and the Modem Artist, Princeton University Press, Princeton (New Jersey),1997.